This tasmanian devil cake is made up of 8" square chocolate cake and a buttercream icing. I made this cake for my best friend when she held her birthday. 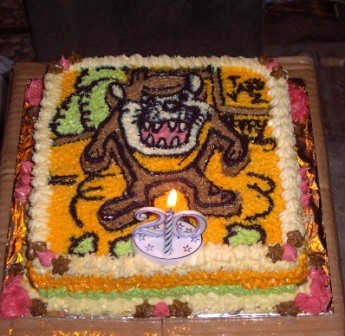 She request me to make a cake for her with the design of her favorite cartoon character, so I tried to visit different website to find that image and luckily I found it and made the design by myself.